Many people lost their lives when a tanker loaded with diesel erupted in flames in Lagos on Wednesday morning. Two hours later, the fire was still raging and it consumed the tanker, a car as well as a tipper truck. 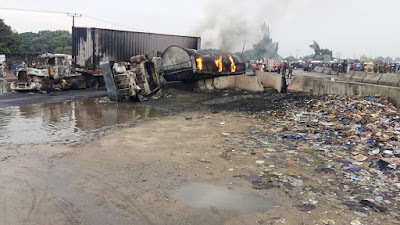 According to the Lagos State Traffic Management Agency, the incident occurred early in the morning at Barracks Bus Stop, the incident occurred around Barracks area, near Iyana-Iba in Lagos State. The road was cordoned off while the vehicles affected were evacuated from the scene of the incident. The Lagos State Emergency Management Agency, LASTMA and the Lagos State Fire Service responded to the emergency and were able to control the fire.